Multiplex RT-PCR of peripheral blood from kidney transplant recipients. Three articles in the current issue provide proof of principle that it might be possible to develop biomarkers capable of predicting outcomes following transplantation. Einecke and colleagues (page 1862) use gene expression profiles to determine the risk of future graft loss, while Newell and colleagues (page 1836) and Sagoo and colleagues (page 1848) use profiling to find biomarkers of tolerance. Citation Information: J Clin Invest. 2010;120(6):1787-1787. https://doi.org/10.1172/JCI43594. Citation Information: J Clin Invest. 2010;120(6):1788-1788. https://doi.org/10.1172/JCI43493. Citation Information: J Clin Invest. 2010;120(6):1789-1789. https://doi.org/10.1172/JCI43397. Citation Information: J Clin Invest. 2010;120(6):1790-1790. https://doi.org/10.1172/JCI43074. Citation Information: J Clin Invest. 2010;120(6):1791-1799. https://doi.org/10.1172/JCI42344. Citation Information: J Clin Invest. 2010;120(6):1800-1803. https://doi.org/10.1172/JCI43424. The classical model of metastasis is that tumor cell dissemination occurs late in tumor development, after the primary tumor has grown, and that only then will tumor cells invade the local tissue, enter the blood or lymphatic vessels, and colonize new sites to cause metastases. However, evidence increasingly indicates that single tumor cells spread to distant sites much earlier than previously believed. In this issue of the JCI, Eyles and colleagues provide new insight into the mechanisms underlying early tumor cell dissemination, formation of metastases, and tumor immunosurveillance using transgenic mice that spontaneously develop melanomas of the uvea. The authors provide striking evidence that tumor cells start to disseminate during the initial steps of tumor development, that late appearing metastases arise from these early disseminated tumor cells, and that CD8+ T cells inhibit the growth of disseminated tumor cells, surprisingly, not by cytotoxic effects, but through cytostatic effects. Citation Information: J Clin Invest. 2010;120(6):1803-1806. https://doi.org/10.1172/JCI43286. Citation Information: J Clin Invest. 2010;120(6):1806-1808. https://doi.org/10.1172/JCI43237. Dysfunction of pancreatic islet β cells underlies both type 1 and type 2 diabetes and appears to result in part from the local release of proinflammatory cytokines. An improved understanding of the mechanisms that mediate islet responsiveness to proinflammatory cytokines may therefore expand our knowledge of the role of cytokine signaling in the development of diabetes, providing potential new targets for the development of therapeutics to protect pancreatic islets from inflammation. In this issue of the JCI, Maier and colleagues identify eukaryotic translation initiation factor 5A (eIF5A) as a critical regulator of the inflammatory response in mouse pancreatic islets. I believe these data provide new and important insights into the regulatory pathways that contribute to the development of diabetes and deepen our understanding of the function of the, so far, rather enigmatic cellular protein eIF5A. Citation Information: J Clin Invest. 2010;120(6):1809-1811. https://doi.org/10.1172/JCI43132. Inflammation occurs in response to both pathogenic insult and tissue damage under sterile conditions, with the latter contributing to the pathogenesis of many diseases. Although several endogenous substances, including uric acid, have been suggested to alert the body to danger and to stimulate inflammation, little is known about their contribution to such responses in vivo. 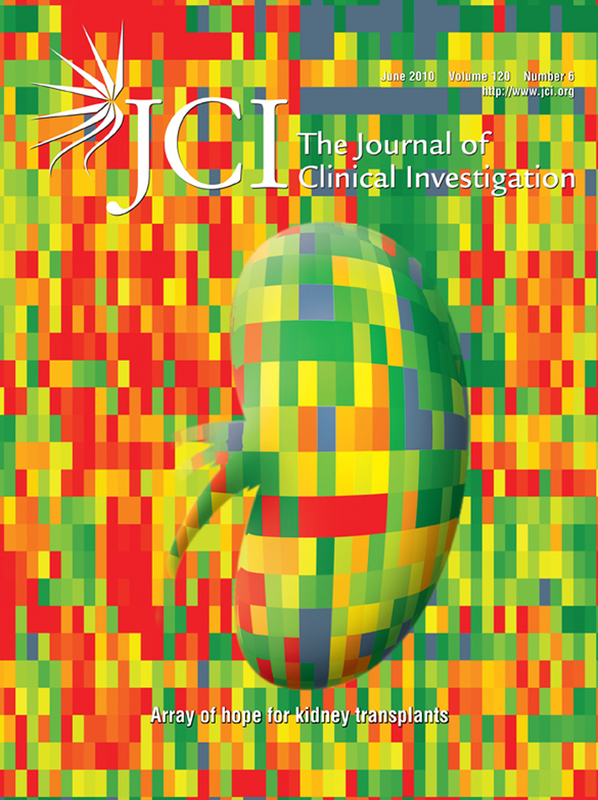 In this issue of the JCI, Kono et al. use newly generated mice with reduced levels of uric acid to investigate its role as an endogenous signal of tissue damage in inflammatory responses to hepatic injury. They find that uric acid is released from dying tissues and induces inflammation to cell death but is not involved in the response to microbial molecules or sterile irritant particles. I believe this to be the first report of an endogenous danger signal acting as a physiological regulator of inflammation. Citation Information: J Clin Invest. 2010;120(6):1812-1823. https://doi.org/10.1172/JCI39715. Citation Information: J Clin Invest. 2010;120(6):1824-1835. https://doi.org/10.1172/JCI41414. Epithelial-cadherin (E-cadherin) is a master organizer of the epithelial phenotype. Its function is regulated in part by p120-catenin (referred to herein as p120), a cytoplasmic binding partner that directly regulates cadherin stability. As it has been suggested that cadherins have a role in inflammatory bowel disease (IBD), we sought to investigate this further by assessing the effect of p120 deficiency in mouse small intestine and colon. p120 conditional KO mice were superficially normal at birth but declined rapidly and died within 21 days. Cell-cell adhesion defects and inflammation led to progressive mucosal erosion and terminal bleeding, similar to what is observed in a dominant-negative cadherin mouse model of IBD. Additionally, selective loss of adherens junctions and accumulation of atypical COX-2–expressing neutrophils in p120-null areas of the colon were observed. To elucidate the mechanism, direct effects of p120 deficiency were assessed in vitro in a polarizing colon cancer cell line. Notably, transepithelial electrical resistance was dramatically reduced, neutrophil binding was increased 30 fold, and levels of COX-2, an enzyme associated with IBD, were markedly increased in neutrophils. Our data suggest that p120 loss disrupts the neonatal intestinal barrier and amplifies neutrophil engagement and that these changes lead to catastrophic inflammation during colonization of the neonatal gut with bacteria and other luminal antigens. Thus, we conclude that p120 has an essential role in barrier function and epithelial homeostasis and survival in the intestine. Citation Information: J Clin Invest. 2010;120(6):1836-1847. https://doi.org/10.1172/JCI39933. Citation Information: J Clin Invest. 2010;120(6):1848-1861. https://doi.org/10.1172/JCI39922. Citation Information: J Clin Invest. 2010;120(6):1862-1872. https://doi.org/10.1172/JCI41789. Citation Information: J Clin Invest. 2010;120(6):1873-1884. https://doi.org/10.1172/JCI40451. The potent regulatory properties of NKT cells render this subset of lipid-specific T cells a promising target for immunotherapeutic interventions. The marine sponge glycolipid α-galactosylceramide (αGalCer) is the proto­typic NKT cell agonist, which elicits this function when bound to CD1d. However, our understanding of the in vivo properties of NKT cell agonists and the host factors that control their bioactivity remains very limited. In this report, we isolated the enzyme fatty acid amide hydrolase (FAAH) from mouse serum as an αGalCer-binding protein that modulates the induction of key effector functions of NKT cells in vivo. FAAH bound αGalCer in vivo and in vitro and was required for the efficient targeting of lipid antigens for CD1d presentation. Immunization of Faah-deficient mice with αGalCer resulted in a reduced systemic cytokine production, but enhanced expansion of splenic NKT cells. This distinct NKT response conferred a drastically increased adjuvant effect and strongly promoted protective CTL responses. Thus, our findings identify not only the presence of FAAH in normal mouse serum, but also its critical role in the tuning of immune responses to lipid antigens by orchestrating their transport and targeting for NKT cell activation. Our results suggest that the serum transport of lipid antigens directly shapes the quality of NKT cell responses, which could potentially be modulated in support of novel vaccination strategies. Citation Information: J Clin Invest. 2010;120(6):1885-1894. https://doi.org/10.1172/JCI41538. CD8+ T cell responses to viral infection are characterized by the emergence of dominant and subdominant CTL populations. The immunodominance hierarchies of these populations are highly reproducible for any given spectrum of virus-induced peptide-MHCI complexes and are likely determined by multiple factors. Recent studies demonstrate a direct correlation between naive epitope-specific CD8+ T cell precursor (CTLp) frequency and the magnitude of the response after antigen challenge. Thus, the number of available precursors in the naive pool has emerged as a key predictor of immunodominance. In contrast to this, we report here no consistent relationship between CTLp frequency and the subsequent magnitude of the immune response for 4 influenza virus–derived epitopes following intranasal infection of mice with influenza A virus. Rather, the characteristic, antigen-driven T cell immunodominance hierarchy was determined by the extent of recruitment from the available pool of epitope-specific precursors and the duration of their continued expansion over the course of the infection. These findings suggest possibilities for enhancing protective immune memory by maximizing both the size and diversity of typically subdominant T cell responses through rational vaccine design. Citation Information: J Clin Invest. 2010;120(6):1895-1904. https://doi.org/10.1172/JCI36581. Ammonia absorption by the medullary thick ascending limb of Henle’s loop (MTALH) is thought to be a critical step in renal ammonia handling and excretion in urine, in which it is the main acid component. Basolateral Na+/H+ exchangers have been proposed to play a role in ammonia efflux out of MTALH cells, which express 2 exchanger isoforms: Na+/H+ exchanger 1 (NHE1) and NHE4. Here, we investigated the role of NHE4 in urinary acid excretion and found that NHE4–/– mice exhibited compensated hyperchloremic metabolic acidosis, together with inappropriate urinary net acid excretion. When challenged with a 7-day HCl load, NHE4–/– mice were unable to increase their urinary ammonium and net acid excretion and displayed reduced ammonium medulla content compared with wild-type littermates. Both pharmacologic inhibition and genetic disruption of NHE4 caused a marked decrease in ammonia absorption by the MTALH. Finally, dietary induction of metabolic acidosis increased NHE4 mRNA expression in mouse MTALH cells and enhanced renal NHE4 activity in rats, as measured by in vitro microperfusion of MTALH. We therefore conclude that ammonia absorption by the MTALH requires the presence of NHE4 and that lack of NHE4 reduces the ability of MTALH epithelial cells to create the cortico-papillary gradient of NH3/NH4+ needed to excrete an acid load, contributing to systemic metabolic acidosis. Citation Information: J Clin Invest. 2010;120(6):1905-1913. https://doi.org/10.1172/JCI40913. Persistent levels of IL-10 play a central role in progressive immune dysfunction associated with chronic viral infections such as HIV, but the underlying mechanisms are poorly understood. Because IL-10 affects the phenotypic and functional properties of DCs, which are responsible for initiating adaptive immune responses, we investigated whether IL-10 induces changes in DC phenotype and function in the context of HIV infection. Here, we show that IL-10 treatment of immature and mature human DCs in culture induced contrasting phenotypic changes in these populations: immature DCs exhibited aberrant resistance to NK cell–mediated elimination, whereas mature DCs exhibited increased susceptibility to NKG2D-dependent NK elimination. Treatment of immature and mature DCs with HIV resulted in potent IL-10 secretion and the same phenotypic and functional changes observed in the IL-10–treated cells. Consistent with these in vitro data, LNs isolated from individuals infected with HIV exhibited aberrant accumulation of a partially “immature” DC population. Together, these data suggest that the progressive immune dysfunction observed in chronic viral infections might be caused in part by IL-10–induced reversal of DC susceptibility to NK cell–mediated elimination, resulting in the accumulation of poorly immunogenic DCs in LNs, the sites of adaptive immune response induction. Citation Information: J Clin Invest. 2010;120(6):1914-1924. https://doi.org/10.1172/JCI42164. Mucormycosis is a fungal infection of the sinuses, brain, or lungs that causes a mortality rate of at least 50% despite first-line therapy. Because angioinvasion is a hallmark of mucormycosis infections, we sought to define the endothelial cell receptor(s) for fungi of the order Mucorales (the fungi that cause mucormycosis). Furthermore, since patients with elevated available serum iron, including those with diabetic ketoacidosis (DKA), are uniquely susceptible to mucormycosis, we sought to define the role of iron and glucose in regulating the expression of such a receptor. Here, we have identified glucose-regulated protein 78 (GRP78) as what we believe to be a novel host receptor that mediates invasion and damage of human endothelial cells by Rhizopus oryzae, the most common etiologic species of Mucorales, but not Candida albicans or Aspergillus fumigatus. Elevated concentrations of glucose and iron, consistent with those seen during DKA, enhanced GRP78 expression and the resulting R. oryzae invasion and damage of endothelial cells in a receptor-dependent manner. Mice with DKA, which have enhanced susceptibility to mucormycosis, exhibited increased expression of GRP78 in sinus, lungs, and brain compared with normal mice. Finally, GRP78-specific immune serum protected mice with DKA from mucormycosis. These results suggest a unique susceptibility of patients with DKA to mucormycosis and provide a foundation for the development of new therapeutic interventions for these deadly infections. Citation Information: J Clin Invest. 2010;120(6):1925-1938. https://doi.org/10.1172/JCI41264. Persistent viral infections are often associated with inefficient T cell responses and sustained high-level expression of inhibitory receptors, such as the NK cell receptor 2B4 (also known as CD244), on virus-specific T cells. However, the role of 2B4 in T cell dysfunction is undefined, and it is unknown whether NK cells contribute to regulation of these processes. We show here that persistent lymphocytic choriomeningitis virus (LCMV) infection of mice lacking 2B4 resulted in diminished LCMV-specific CD8+ T cell responses, prolonged viral persistence, and spleen and thymic pathologies that differed from those observed in infected wild-type mice. Surprisingly, these altered phenotypes were not caused by 2B4 deficiency in T cells. Rather, the entire and long-lasting pathology and viral persistence were regulated by 2B4-deficient NK cells acting early in infection. In the absence of 2B4, NK cells lysed activated (defined as CD44hi) but not naive (defined as CD44lo) CD8+ T cells in a perforin-dependent manner in vitro and in vivo. These results illustrate the importance of NK cell self-tolerance to activated CD8+ T cells and demonstrate how an apparent T cell–associated persistent infection can actually be regulated by NK cells. Citation Information: J Clin Invest. 2010;120(6):1939-1949. https://doi.org/10.1172/JCI40124. Necrosis stimulates inflammation, and this response is medically relevant because it contributes to the pathogenesis of a number of diseases. It is thought that necrosis stimulates inflammation because dying cells release proinflammatory molecules that are recognized by the immune system. However, relatively little is known about the molecular identity of these molecules and their contribution to responses in vivo. Here, we investigated the role of uric acid in the inflammatory response to necrotic cells in mice. We found that dead cells not only released intracellular stores of uric acid but also produced it in large amounts postmortem as nucleic acids were degraded. Using newly developed Tg mice that have reduced levels of uric acid either intracellularly and/or extracellularly, we found that uric acid depletion substantially reduces the cell death–induced inflammatory response. Similar results were obtained with pharmacological treatments that reduced uric acid levels either by blocking its synthesis or hydrolyzing it in the extracellular fluids. Importantly, uric acid depletion selectively inhibited the inflammatory response to dying cells but not to microbial molecules or sterile irritant particles. Collectively, our data identify uric acid as a proinflammatory molecule released from dying cells that contributes significantly to the cell death–induced inflammatory responses in vivo. Citation Information: J Clin Invest. 2010;120(6):1950-1960. https://doi.org/10.1172/JCI38369. Plasminogen activation to plasmin protects from lung fibrosis, but the mechanism underlying this antifibrotic effect remains unclear. We found that mice lacking plasminogen activation inhibitor–1 (PAI-1), which are protected from bleomycin-induced pulmonary fibrosis, exhibit lung overproduction of the antifibrotic lipid mediator prostaglandin E2 (PGE2). Plasminogen activation upregulated PGE2 synthesis in alveolar epithelial cells, lung fibroblasts, and lung fibrocytes from saline- and bleomycin-treated mice, as well as in normal fetal and adult primary human lung fibroblasts. This response was exaggerated in cells from Pai1–/– mice. Although enhanced PGE2 formation required the generation of plasmin, it was independent of proteinase-activated receptor 1 (PAR-1) and instead reflected proteolytic activation and release of HGF with subsequent induction of COX-2. That the HGF/COX-2/PGE2 axis mediates in vivo protection from fibrosis in Pai1–/– mice was demonstrated by experiments showing that a selective inhibitor of the HGF receptor c-Met increased lung collagen to WT levels while reducing COX-2 protein and PGE2 levels. Of clinical interest, fibroblasts from patients with idiopathic pulmonary fibrosis were found to be defective in their ability to induce COX-2 and, therefore, unable to upregulate PGE2 synthesis in response to plasmin or HGF. These studies demonstrate crosstalk between plasminogen activation and PGE2 generation in the lung and provide a mechanism for the well-known antifibrotic actions of the fibrinolytic pathway. Citation Information: J Clin Invest. 2010;120(6):1961-1970. https://doi.org/10.1172/JCI41384. The transcription factor kruppel-like factor 2 (KLF2) is required for the quiescent and migratory properties of naive T cells. Statins, a class of HMG-CoA reductase inhibitors, display pleiotropic immunomodulatory effects that are independent of their lipid-lowering capacity and may be beneficial as therapeutic agents for T cell–mediated inflammatory diseases. Statins upregulate KLF2 expression in endothelial cells, and this activity is associated with an antiinflammatory phenotype. We therefore hypothesized that the immunomodulatory effects of statins are due, in part, to their direct effects on T cell KLF2 gene expression. Here we report that lipophilic statin treatment of mouse and human T cells increased expression of KLF2 through a HMG-CoA/prenylation–dependent pathway. Statins also diminished T cell proliferation and IFN-γ expression. shRNA blockade of KLF2 expression in human T cells increased IFN-γ expression and prevented statin-induced IFN-γ reduction. In a mouse model of myocarditis induced by heart antigen–specific CD8+ T cells, both statin treatment of the T cells and retrovirally mediated overexpression of KLF2 in the T cells had similar ameliorating effects on disease induction. We conclude that statins reduce inflammatory functions and pathogenic activity of T cells through KLF2-dependent mechanisms, and this pathway may be a potential therapeutic target for cardiovascular diseases. Citation Information: J Clin Invest. 2010;120(6):1971-1980. https://doi.org/10.1172/JCI40380. Activated protein C (APC), the only FDA-approved biotherapeutic drug for sepsis, possesses anticoagulant, antiinflammatory, and barrier-protective activities. However, the mechanisms underlying its anti­inflammatory functions are not well defined. Here, we report that the antiinflammatory activity of APC on macrophages is dependent on integrin CD11b/CD18, but not on endothelial protein C receptor (EPCR). We showed that CD11b/CD18 bound APC within specialized membrane microdomains/lipid rafts and facilitated APC cleavage and activation of protease-activated receptor–1 (PAR1), leading to enhanced production of sphingosine-1-phosphate (S1P) and suppression of the proinflammatory response of activated macrophages. Deletion of the γ-carboxyglutamic acid domain of APC, a region critical for its anticoagulant activity and EPCR-dependent barrier protection, had no effect on its antiinflammatory function. Genetic inactivation of CD11b, PAR1, or sphingosine kinase–1, but not EPCR, abolished the ability of APC to suppress the macrophage inflammatory response in vitro. Using an LPS-induced mouse model of lethal endotoxemia, we showed that APC administration reduced the mortality of wild-type mice, but not CD11b-deficient mice. These data establish what we believe to be a novel mechanism underlying the antiinflammatory activity of APC in the setting of endotoxemia and provide clear evidence that the antiinflammatory function of APC is distinct from its barrier-protective function and anticoagulant activities. Citation Information: J Clin Invest. 2010;120(6):1981-1993. https://doi.org/10.1172/JCI39650. The modeling and remodeling of bone requires activation and polarization of osteoclasts, achieved by reorganization of the cytoskeleton. Members of the Rho subfamily of small GTPases, including Cdc42, are known regulators of cytoskeletal components, but the role of these proteins in bone physiology and pathophysiology remains unclear. Here, we examined loss-of-function mice in which Cdc42 was selectively ablated in differentiated osteoclasts and gain-of-function animals wherein Cdc42Gap, a protein that inactivates the small GTPase, was deleted globally. Cdc42 loss-of-function mice were osteopetrotic and resistant to ovariectomy-induced bone loss, while gain-of-function animals were osteoporotic. Isolated Cdc42-deficient osteoclasts displayed suppressed bone resorption, while osteoclasts with increased Cdc42 activity had enhanced resorptive capacity. We further demonstrated that Cdc42 modulated M-CSF–stimulated cyclin D expression and phosphorylation of Rb and induced caspase 3 and Bim, thus contributing to osteoclast proliferation and apoptosis rates. Furthermore, Cdc42 was required for multiple M-CSF– and RANKL-induced osteoclastogenic signals including activation and expression of the differentiation factors MITF and NFATc1 and was a component of the Par3/Par6/atypical PKC polarization complex in osteoclasts. These data suggest that Cdc42 regulates osteoclast formation and function and may represent a promising therapeutic target for prevention of pathological bone loss. Citation Information: J Clin Invest. 2010;120(6):1994-2004. https://doi.org/10.1172/JCI41554. The molecular mechanisms that govern bone and joint formation are complex, involving an integrated network of signaling pathways and gene regulators. We investigated the role of Hox genes, which are known to specify individual segments of the skeleton, in the formation of autopod limb bones (i.e., the hands and feet) using the mouse mutant synpolydactyly homolog (spdh), which encodes a polyalanine expansion in Hoxd13. We found that no cortical bone was formed in the autopod in spdh/spdh mice; instead, these bones underwent trabecular ossification after birth. Spdh/spdh metacarpals acquired an ovoid shape and developed ectopic joints, indicating a loss of long bone characteristics and thus a transformation of metacarpals into carpal bones. The perichondrium of spdh/spdh mice showed abnormal morphology and decreased expression of Runt-related transcription factor 2 (Runx2), which was identified as a direct Hoxd13 transcriptional target. Hoxd11–/–Hoxd12–/–Hoxd13–/– triple-knockout mice and Hoxd13–/–Hoxa13+/– mice exhibited similar but less severe defects, suggesting that these Hox genes have similar and complementary functions and that the spdh allele acts as a dominant negative. This effect was shown to be due to sequestration of other polyalanine-containing transcription factors by the mutant Hoxd13 in the cytoplasm, leading to their degradation. These data indicate that Hox genes not only regulate patterning but also directly influence bone formation and the ossification pattern of bones, in part via Runx2. Citation Information: J Clin Invest. 2010;120(6):2005-2015. https://doi.org/10.1172/JCI41250. Citation Information: J Clin Invest. 2010;120(6):2016-2029. https://doi.org/10.1172/JCI39896. Erythropoietin reportedly has beneficial effects on the heart after myocardial infarction, but the underlying mechanisms of these effects are unknown. We here demonstrate that sonic hedgehog is a critical mediator of erythropoietin-induced cardioprotection in mice. Treatment of mice with erythropoietin inhibited left ventricular remodeling and improved cardiac function after myocardial infarction, independent of erythropoiesis and the mobilization of bone marrow–derived cells. Erythropoietin prevented cardiomyocyte apoptosis and increased the number of capillaries and mature vessels in infarcted hearts by upregulating the expression of angiogenic cytokines such as VEGF and angiopoietin-1 in cardiomyocytes. Erythropoietin also increased the expression of sonic hedgehog in cardiomyocytes, and inhibition of sonic hedgehog signaling suppressed the erythropoietin-induced increase in angiogenic cytokine expression. Furthermore, the beneficial effects of erythropoietin on infarcted hearts were abolished by cardiomyocyte-specific deletion of sonic hedgehog. These results suggest that erythropoietin protects the heart after myocardial infarction by inducing angiogenesis through sonic hedgehog signaling. Citation Information: J Clin Invest. 2010;120(6):2030-2039. https://doi.org/10.1172/JCI42002. Although metastasis is the leading cause of cancer-related death, it is not clear why some patients with localized cancer develop metastatic disease after complete resection of their primary tumor. Such relapses have been attributed to tumor cells that disseminate early and remain dormant for prolonged periods of time; however, little is known about the control of these disseminated tumor cells. Here, we have used a spontaneous mouse model of melanoma to investigate tumor cell dissemination and immune control of metastatic outgrowth. Tumor cells were found to disseminate throughout the body early in development of the primary tumor, even before it became clinically detectable. The disseminated tumor cells remained dormant for varying periods of time depending on the tissue, resulting in staggered metastatic outgrowth. Dormancy in the lung was associated with reduced proliferation of the disseminated tumor cells relative to the primary tumor. This was mediated, at least in part, by cytostatic CD8+ T cells, since depletion of these cells resulted in faster outgrowth of visceral metastases. Our findings predict that immune responses favoring dormancy of disseminated tumor cells, which we propose to be the seed of subsequent macroscopic metastases, are essential for prolonging the survival of early stage cancer patients and suggest that therapeutic strategies designed to reinforce such immune responses may produce marked benefits in these patients. Citation Information: J Clin Invest. 2010;120(6):2040-2048. https://doi.org/10.1172/JCI40253. The developmental abnormalities associated with disruption of signaling by retinoic acid (RA), the biologically active form of vitamin A, have been known for decades from studies in animal models and humans. These include defects in the respiratory system, such as lung hypoplasia and agenesis. However, the molecular events controlled by RA that lead to formation of the lung primordium from the primitive foregut remain unclear. Here, we present evidence that endogenous RA acts as a major regulatory signal integrating Wnt and Tgfβ pathways in the control of Fgf10 expression during induction of the mouse primordial lung. We demonstrated that activation of Wnt signaling required for lung formation was dependent on local repression of its antagonist, Dickkopf homolog 1 (Dkk1), by endogenous RA. Moreover, we showed that simultaneously activating Wnt and repressing Tgfβ allowed induction of both lung buds in RA-deficient foreguts. The data in this study suggest that disruption of Wnt/Tgfβ/Fgf10 interactions represents the molecular basis for the classically reported failure to form lung buds in vitamin A deficiency. Citation Information: J Clin Invest. 2010;120(6):2049-2057. https://doi.org/10.1172/JCI38644. Pulmonary fibrosis is a progressive, dysregulated response to injury culminating in compromised lung function due to excess extracellular matrix production. The heparan sulfate proteoglycan syndecan-4 is important in mediating fibroblast-matrix interactions, but its role in pulmonary fibrosis has not been explored. To investigate this issue, we used intratracheal instillation of bleomycin as a model of acute lung injury and fibrosis. We found that bleomycin treatment increased syndecan-4 expression. Moreover, we observed a marked decrease in neutrophil recruitment and an increase in both myofibroblast recruitment and interstitial fibrosis in bleomycin-treated syndecan-4–null (Sdc4–/–) mice. Subsequently, we identified a direct interaction between CXCL10, an antifibrotic chemokine, and syndecan-4 that inhibited primary lung fibroblast migration during fibrosis; mutation of the heparin-binding domain, but not the CXCR3 domain, of CXCL10 diminished this effect. Similarly, migration of fibroblasts from patients with pulmonary fibrosis was inhibited in the presence of CXCL10 protein defective in CXCR3 binding. Furthermore, administration of recombinant CXCL10 protein inhibited fibrosis in WT mice, but not in Sdc4–/– mice. Collectively, these data suggest that the direct interaction of syndecan-4 and CXCL10 in the lung interstitial compartment serves to inhibit fibroblast recruitment and subsequent fibrosis. Thus, administration of CXCL10 protein defective in CXCR3 binding may represent a novel therapy for pulmonary fibrosis. Citation Information: J Clin Invest. 2010;120(6):2058-2069. https://doi.org/10.1172/JCI42032. Hematopoietic stem and progenitor cell (HSPC) expansion is regulated by intrinsic signaling pathways activated by cytokines. The intracellular kinase JAK2 plays an essential role in cytokine signaling, and activating mutations in JAK2 are found in a number of hematologic malignancies. We previously demonstrated that lymphocyte adaptor protein (Lnk, also known as Sh2b3) binds JAK2 and attenuates its activity, thereby limiting HSPC expansion. Here we show that loss of Lnk accelerates and exacerbates oncogenic JAK2-induced myeloproliferative diseases (MPDs) in mice. Specifically, Lnk deficiency enhanced cytokine-independent JAK/STAT signaling and augmented the ability of oncogenic JAK2 to expand myeloid progenitors in vitro and in vivo. An activated form of JAK2, unable to bind Lnk, caused greater myeloid expansion than activated JAK2 alone and accelerated myelofibrosis, indicating that Lnk directly inhibits oncogenic JAK2 in constraining MPD development. In addition, Lnk deficiency cooperated with the BCR/ABL oncogene, the product of which does not directly interact with or depend on JAK2 or Lnk, in chronic myeloid leukemia (CML) development, suggesting that Lnk also acts through endogenous pathways to constrain HSPCs. Consistent with this idea, aged Lnk–/– mice spontaneously developed a CML-like MPD. Taken together, our data establish Lnk as a bona fide suppressor of MPD in mice and raise the possibility that Lnk dysfunction contributes to the development of hematologic malignancies in humans. Citation Information: J Clin Invest. 2010;120(6):2070-2080. https://doi.org/10.1172/JCI40331. Mice engineered to express c-Myc in B cells (Eμ-myc mice) develop lethal lymphomas in which the gene encoding the p53 tumor suppressor is frequently mutated. Whether the p53 homolog p73 also functions as a tumor suppressor in vivo remains controversial. Here we have shown that p73 loss does not substantially affect disease onset and mortality in Eμ-myc mice. However, it does alter the phenotype of the disease. Specifically, p73 loss decreased nodal disease and increased widespread extranodal dissemination. We further found that p53 acted as the dominant tumor suppressor during the onset of Eμ-myc–driven B cell lymphomagenesis, while p73 modulated tumor dissemination and extranodal growth. Immunophenotyping and expression profiling suggested that p73 loss allowed increased maturation of malignant B cells and deregulated genes involved in lymphocyte homing and dissemination of human lymphomas. Consistent with this, p73 expression was frequently downregulated in a large cohort of human mature aggressive B cell lymphomas, and both the incidence and degree of p73 downregulation in these tumors correlated with their extranodal dissemination status. These data indicate that p73 is a modifier of Myc-driven lymphomas in mice, favoring tumor dissemination, and suggest that p73 could be a biomarker for human B cell lymphoma dissemination, a notion that can now be tested in clinicopathologic correlation studies. Citation Information: J Clin Invest. 2010;120(6):2081-2093. https://doi.org/10.1172/JCI40676. Epithelial-mesenchymal interactions regulate normal gut epithelial homeostasis and have a putative role in inflammatory bowel disease and colon cancer pathogenesis. Epimorphin is a mesenchymal and myofibroblast protein with antiproliferative, promorphogenic effects in intestinal epithelium. We previously showed that deletion of epimorphin partially protects mice from acute colitis, associated with an increase in crypt cell proliferation. Here we explored the potential therapeutic utility of modulating epimorphin expression by examining the effects of epimorphin deletion on chronic inflammation–associated colon carcinogenesis using the azoxymethane/dextran sodium sulfate (AOM/DSS) model. We found that mice in which epimorphin expression was absent had a marked reduction in incidence and extent of colonic dysplasia. Furthermore, epimorphin deletion in myofibroblasts altered the morphology and growth of cocultured epithelial cells. Loss of epimorphin affected secretion of soluble mesenchymal regulators of the stem cell niche such as Chordin. Importantly, IL-6 secretion from LPS-treated epimorphin-deficient myofibroblasts was completely inhibited, and stromal IL-6 expression was reduced in vivo. Taken together, these data show that epimorphin deletion inhibits chronic inflammation–associated colon carcinogenesis in mice, likely as a result of increased epithelial repair, decreased myofibroblast IL-6 secretion, and diminished IL-6–induced inflammation. Furthermore, we believe that modulation of epimorphin expression may have therapeutic benefits in appropriate clinical settings. Citation Information: J Clin Invest. 2010;120(6):2094-2108. https://doi.org/10.1172/JCI40778. Inactivation of phosphatase and tensin homolog (PTEN) is a critical step during tumorigenesis, and PTEN inactivation by genetic and epigenetic means has been well studied. There is also evidence suggesting that PTEN negative regulators (PTEN-NRs) have a role in PTEN inactivation during tumorigenesis, but their identity has remained elusive. Here we have identified shank-interacting protein–like 1 (SIPL1) as a PTEN-NR in human tumor cell lines and human primary cervical cancer cells. Ectopic SIPL1 expression protected human U87 glioma cells from PTEN-mediated growth inhibition and promoted the formation of HeLa cell–derived xenograft tumors in immunocompromised mice. Conversely, siRNA-mediated knockdown of SIPL1 expression inhibited the growth of both HeLa cells and DU145 human prostate carcinoma cells in vitro and in vivo in a xenograft tumor model. These inhibitions were reversed by concomitant knockdown of PTEN, demonstrating that SIPL1 affects tumorigenesis via inhibition of PTEN function. Mechanistically, SIPL1 was found to interact with PTEN through its ubiquitin-like domain (UBL), inhibiting the phosphatidylinositol 3,4,5-trisphosphate (PIP3) phosphatase activity of PTEN. Furthermore, SIPL1 expression correlated with loss of PTEN function in PTEN-positive human primary cervical cancer tissue. Taken together, these observations indicate that SIPL1 is a PTEN-NR and that it facilitates tumorigenesis, at least in part, through its PTEN inhibitory function. Citation Information: J Clin Invest. 2010;120(6):2109-2118. https://doi.org/10.1172/JCI39964. Antiapoptotic BCL2 family members have been implicated in the pathogenesis of acute myelogenous leukemia (AML), but the functional significance and relative importance of individual proteins (e.g., BCL2, BCL-XL, and myeloid cell leukemia 1 [MCL1]) remain poorly understood. Here, we examined the expression of BCL2, BCL-XL, and MCL1 in primary human hematopoietic subsets and leukemic blasts from AML patients and found that MCL1 transcripts were consistently expressed at high levels in all samples tested. Consistent with this, Mcl1 protein was also highly expressed in myeloid leukemic blasts in a mouse Myc-induced model of AML. We used this model to test the hypothesis that Mcl1 facilitates AML development by allowing myeloid progenitor cells to evade Myc-induced cell death. Indeed, activation of Myc for 7 days in vivo substantially increased myeloid lineage cell numbers, whereas hematopoietic stem, progenitor, and B-lineage cells were depleted. Furthermore, Mcl1 haploinsufficiency abrogated AML development. In addition, deletion of a single allele of Mcl1 from fully transformed AML cells substantially prolonged the survival of transplanted mice. Conversely, the rapid lethality of disease was restored by coexpression of Bcl2 and Myc in Mcl1-haploinsufficient cells. Together, these data demonstrate a critical and dose-dependent role for Mcl1 in AML pathogenesis in mice and suggest that MCL1 may be a promising therapeutic target in patients with de novo AML. Citation Information: J Clin Invest. 2010;120(6):2119-2130. https://doi.org/10.1172/JCI40583. The gene encoding COMM domain–containing 1 (COMMD1) is a prototypical member of the COMMD gene family that has been shown to inhibit both NF-κB– and HIF-mediated gene expression. NF-κB and HIF are transcription factors that have been shown to play a role in promoting tumor growth, survival, and invasion. In this study, we demonstrate that COMMD1 expression is frequently suppressed in human cancer and that decreased COMMD1 expression correlates with a more invasive tumor phenotype. We found that direct repression of COMMD1 in human cell lines led to increased tumor invasion in a chick xenograft model, while increased COMMD1 expression in mouse melanoma cells led to decreased lung metastasis in a mouse model. Decreased COMMD1 expression also correlated with increased expression of genes known to promote cancer cell invasiveness, including direct targets of HIF. Mechanistically, our studies show that COMMD1 inhibits HIF-mediated gene expression by binding directly to the amino terminus of HIF-1α, preventing its dimerization with HIF-1β and subsequent DNA binding and transcriptional activation. Altogether, our findings demonstrate a role for COMMD1 in tumor invasion and provide a detailed mechanism of how this factor regulates the HIF pathway in cancer cells. Citation Information: J Clin Invest. 2010;120(6):2131-2143. https://doi.org/10.1172/JCI41344. Enteropathy-associated T cell lymphoma is a severe complication of celiac disease (CD). One mechanism suggested to underlie its development is chronic exposure of intraepithelial lymphocytes (IELs) to potent antiapoptotic signals initiated by IL-15, a cytokine overexpressed in the enterocytes of individuals with CD. However, the signaling pathway by which IL-15 transmits these antiapoptotic signals has not been firmly established. Here we show that the survival signals delivered by IL-15 to freshly isolated human IELs and to human IEL cell lines derived from CD patients with type II refractory CD (RCDII) — a clinicopathological entity considered an intermediary step between CD and enteropathy-associated T cell lymphoma — depend on the antiapoptotic factors Bcl-2 and/or Bcl-xL. The signals also required IL-15Rβ, Jak3, and STAT5, but were independent of PI3K, ERK, and STAT3. Consistent with these data, IELs from patients with active CD and RCDII contained increased amounts of Bcl-xL, phospho-Jak3, and phospho-STAT5. Furthermore, incubation of patient duodenal biopsies with a fully humanized human IL-15–specific Ab effectively blocked Jak3 and STAT5 phosphorylation. In addition, treatment with this Ab induced IEL apoptosis and wiped out the massive IEL accumulation in mice overexpressing human IL-15 in their gut epithelium. Together, our results delineate the IL-15–driven survival pathway in human IELs and demonstrate that IL-15 and its downstream effectors are meaningful therapeutic targets in RCDII. Citation Information: J Clin Invest. 2010;120(6):2144-2155. https://doi.org/10.1172/JCI42021. Heterozygous mutations of GATA3, which encodes a dual zinc-finger transcription factor, cause hypoparathyroidism with sensorineural deafness and renal dysplasia. Here, we have investigated the role of GATA3 in parathyroid function by challenging Gata3+/– mice with a diet low in calcium and vitamin D so as to expose any defects in parathyroid function. This led to a higher mortality among Gata3+/– mice compared with Gata3+/+ mice. Compared with their wild-type littermates, Gata3+/– mice had lower plasma concentrations of calcium and parathyroid hormone (PTH) and smaller parathyroid glands with a reduced Ki-67 proliferation rate. At E11.5, Gata3+/– embryos had smaller parathyroid-thymus primordia with fewer cells expressing the parathyroid-specific gene glial cells missing 2 (Gcm2), the homolog of human GCMB. In contrast, E11.5 Gata3–/– embryos had no Gcm2 expression and by E12.5 had gross defects in the third and fourth pharyngeal pouches, including absent parathyroid-thymus primordia. Electrophoretic mobility shift, luciferase reporter, and chromatin immunoprecipitation assays showed that GATA3 binds specifically to a functional double-GATA motif within the GCMB promoter. Thus, GATA3 is critical for the differentiation and survival of parathyroid progenitor cells and, with GCM2/B, forms part of a transcriptional cascade in parathyroid development and function. Citation Information: J Clin Invest. 2010;120(6):2156-2170. https://doi.org/10.1172/JCI38924. In both type 1 and type 2 diabetes, pancreatic islet dysfunction results in part from cytokine-mediated inflammation. The ubiquitous eukaryotic translation initiation factor 5A (eIF5A), which is the only protein to contain the amino acid hypusine, contributes to the production of proinflammatory cytokines. We therefore investigated whether eIF5A participates in the inflammatory cascade leading to islet dysfunction during the development of diabetes. As described herein, we found that eIF5A regulates iNOS levels and that eIF5A depletion as well as the inhibition of hypusination protects against glucose intolerance in inflammatory mouse models of diabetes. We observed that following knockdown of eIF5A expression, mice were resistant to β cell loss and the development of hyperglycemia in the low-dose streptozotocin model of diabetes. The depletion of eIF5A led to impaired translation of iNOS-encoding mRNA within the islet. A role for the hypusine residue of eIF5A in islet inflammatory responses was suggested by the observation that inhibition of hypusine synthesis reduced translation of iNOS-encoding mRNA in rodent β cells and human islets and protected mice against the development of glucose intolerance the low-dose streptozotocin model of diabetes. Further analysis revealed that hypusine is required in part for nuclear export of iNOS-encoding mRNA, a process that involved the export protein exportin1. These observations identify the hypusine modification of eIF5A as a potential therapeutic target for preserving islet function under inflammatory conditions. Citation Information: J Clin Invest. 2010;120(6):2171-2183. https://doi.org/10.1172/JCI35846. Hypoxia-inducible factor-1α (HIF-1α) is a transcription factor that regulates cellular stress responses. While the levels of HIF-1α protein are tightly regulated, recent studies suggest that it can be active under normoxic conditions. We hypothesized that HIF-1α is required for normal β cell function and reserve and that dysregulation may contribute to the pathogenesis of type 2 diabetes (T2D). Here we show that HIF-1α protein is present at low levels in mouse and human normoxic β cells and islets. Decreased levels of HIF-1α impaired glucose-stimulated ATP generation and β cell function. C57BL/6 mice with β cell–specific Hif1a disruption (referred to herein as β-Hif1a-null mice) exhibited glucose intolerance, β cell dysfunction, and developed severe glucose intolerance on a high-fat diet. Increasing HIF-1α levels by inhibiting its degradation through iron chelation markedly improved insulin secretion and glucose tolerance in control mice fed a high-fat diet but not in β-Hif1a-null mice. Increasing HIF-1α levels markedly increased expression of ARNT and other genes in human T2D islets and improved their function. Further analysis indicated that HIF-1α was bound to the Arnt promoter in a mouse β cell line, suggesting direct regulation. Taken together, these findings suggest an important role for HIF-1α in β cell reserve and regulation of ARNT expression and demonstrate that HIF-1α is a potential therapeutic target for the β cell dysfunction of T2D. Citation Information: J Clin Invest. 2010;120(6):2184-2193. https://doi.org/10.1172/JCI41541. A variety of neurotransmitters, gastrointestinal hormones, and metabolic signals are known to potentiate insulin secretion through GPCRs. We show here that β cell–specific inactivation of the genes encoding the G protein α-subunits Gαq and Gα11 resulted in impaired glucose tolerance and insulin secretion in mice. Interestingly, the defects observed in Gαq/Gα11-deficient β cells were not restricted to loss of muscarinic or metabolic potentiation of insulin release; the response to glucose per se was also diminished. Electrophysiological recordings revealed that glucose-induced depolarization of isolated β cells was impaired in the absence of Gαq/Gα11, and closure of KATP channels was inhibited. We provide evidence that this reduced excitability was due to a loss of β cell–autonomous potentiation of insulin secretion through factors cosecreted with insulin. We identified as autocrine mediators involved in this process extracellular nucleotides such as uridine diphosphate acting through the Gq/G11-coupled P2Y6 receptor and extracellular calcium acting through the calcium-sensing receptor. Thus, the Gq/G11-mediated signaling pathway potentiates insulin secretion in response to glucose by integrating systemic as well as autocrine/paracrine mediators. Citation Information: J Clin Invest. 2010;120(6):2194-2205. https://doi.org/10.1172/JCI41722. The best-known function of the serine protease tissue-type plasminogen activator (tPA) is as a thrombolytic enzyme. However, it is also found in structures of the brain that are highly vulnerable to hypoxia-induced cell death, where its association with neuronal survival is poorly understood. Here, we have demonstrated that hippocampal areas of the mouse brain lacking tPA activity are more vulnerable to neuronal death following an ischemic insult. We found that sublethal hypoxia, which elicits tolerance to subsequent lethal hypoxic/ischemic injury in a natural process known as ischemic preconditioning (IPC), induced a rapid release of neuronal tPA. Treatment of hippocampal neurons with tPA induced tolerance against a lethal hypoxic insult applied either immediately following insult (early IPC) or 24 hours later (delayed IPC). tPA-induced early IPC was independent of the proteolytic activity of tPA and required the engagement of a member of the LDL receptor family. In contrast, tPA-induced delayed IPC required the proteolytic activity of tPA and was mediated by plasmin, the NMDA receptor, and PKB phosphorylation. We also found that IPC in vivo increased tPA activity in the cornu ammonis area 1 (CA1) layer and Akt phosphorylation in the hippocampus, as well as ischemic tolerance in wild-type but not tPA- or plasminogen-deficient mice. These data show that tPA can act as an endogenous neuroprotectant in the murine hippocampus. Citation Information: J Clin Invest. 2010;120(6):2206-2217. https://doi.org/10.1172/JCI41977. Hypothyroidism in humans is characterized by severe neurological consequences that are often irreversible, highlighting the critical role of thyroid hormone (TH) in the brain. Despite this, not much is known about the signaling pathways that control TH action in the brain. What is known is that the prohormone thyroxine (T4) is converted to the active hormone triiodothyronine (T3) by type 2 deiodinase (D2) and that this occurs in astrocytes, while TH receptors and type 3 deiodinase (D3), which inactivates T3, are found in adjacent neurons. Here, we modeled TH action in the brain using an in vitro coculture system of D2-expressing H4 human glioma cells and D3-expressing SK-N-AS human neuroblastoma cells. We found that glial cell D2 activity resulted in increased T3 production, which acted in a paracrine fashion to induce T3-responsive genes, including ectonucleotide pyrophosphatase/phosphodiesterase 2 (ENPP2), in the cocultured neurons. D3 activity in the neurons modulated these effects. Furthermore, this paracrine pathway was regulated by signals such as hypoxia, hedgehog signaling, and LPS-induced inflammation, as evidenced both in the in vitro coculture system and in in vivo rat models of brain ischemia and mouse models of inflammation. This study therefore presents what we believe to be the first direct evidence for a paracrine loop linking glial D2 activity to TH receptors in neurons, thereby identifying deiodinases as potential control points for the regulation of TH signaling in the brain during health and disease. Citation Information: J Clin Invest. 2010;120(6):2218-2229. https://doi.org/10.1172/JCI40141. IgE-mediated hypersensitivity is central to the pathogenesis of asthma and other allergic diseases. Although neutralization of serum IgE with IgE-specific antibodies is in general an efficacious treatment for allergic asthma, one limitation of this approach is its lack of effect on IgE production. Here, we have developed a strategy to disrupt IgE production by generating monoclonal antibodies that target a segment of membrane IgE on human IgE-switched B cells that is not present in serum IgE. This segment is known as the M1′ domain, and using genetically modified mice that contain the human M1′ domain inserted into the mouse IgE locus, we demonstrated that M1′-specific antibodies reduced serum IgE and IgE-producing plasma cells in vivo, without affecting other immunoglobulin isotypes. M1′-specific antibodies were effective when delivered prophylactically and therapeutically in mouse models of immunization, allergic asthma, and Nippostrongylus brasiliensis infection, likely by inducing apoptosis of IgE-producing B cells. In addition, we generated a humanized M1′-specific antibody that was active on primary human cells in vivo, as determined by its reduction of serum IgE levels and IgE plasma cell numbers in a human PBMC-SCID mouse model. Thus, targeting of human IgE-producing B cells with apoptosis-inducing M1′-specific antibodies may be a novel treatment for asthma and allergy. Citation Information: J Clin Invest. 2010;120(6):2230-2242. https://doi.org/10.1172/JCI37646. Identifying the antigens that have the potential to trigger endogenous antitumor responses in an individual cancer patient is likely to enhance the efficacy of cancer immunotherapy, but current methodologies do not efficiently identify such antigens. This study describes what we believe to be a new method of comprehensively identifying candidate tissue antigens that spontaneously cause T cell responses in disease situations. We used the newly developed automated, two-dimensional chromatography system PF2D to fractionate the proteome of human tumor tissues and tested protein fractions for recognition by preexisting tumor-specific CD4+ Th cells and CTLs. Applying this method using mice transgenic for a TCR that recognizes an OVA peptide presented by MHC class I, we demonstrated efficient separation, processing, and cross-presentation to CD8+ T cells by DCs of OVA expressed by the OVA-transfected mouse lymphoma RMA-OVA. Applying this method to human tumor tissues, we identified MUC1 and EGFR as tumor-associated antigens selectively recognized by T cells in patients with head and neck cancer. Finally, in an exemplary patient with a malignant brain tumor, we detected CD4+ and CD8+ T cell responses against two novel antigens, transthyretin and calgranulin B/S100A9, which were expressed in tumor and endothelial cells. The immunogenicity of these antigens was confirmed in 4 of 10 other brain tumor patients. This fast and inexpensive method therefore appears suitable for identifying candidate T cell antigens in various disease situations, such as autoimmune and malignant diseases, without being restricted to expression by a certain cell type or HLA allele. Citation Information: J Clin Invest. 2010;120(6):2243-2247. https://doi.org/10.1172/JCI43606. Citation Information: J Clin Invest. 2010;120(6):2248-2248. https://doi.org/10.1172/JCI38061C1.